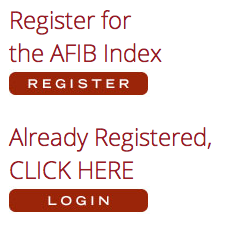 For the first time, health care practitioners and policymakers now have access to important information about the prevalence and incidence of atrial fibrillation (AF). Whether it is evaluating AF at the national, state, county, metropolitan statistical level – even zip code – users will be able to distinguish how this disease is impacting various aging populations; evaluate gender-related and racial differences; and define where healthcare resources should be allocated to reduce the risk of AF-associated co-morbidities. The data and associated maps that are available through the AFIB Index were developed by the National Health Index (www.healthindexcorp.com), a subsidiary of the National Minority Quality Forum (www.nmqf.org). Prevalence of AF among Medicare beneficiaries increased 17% from 2000 to 2010. Warfarin use among diagnosed AF Medicare beneficiaries is less than 50%. © 2016 National Health Index, LLC. All Rights Reserved.